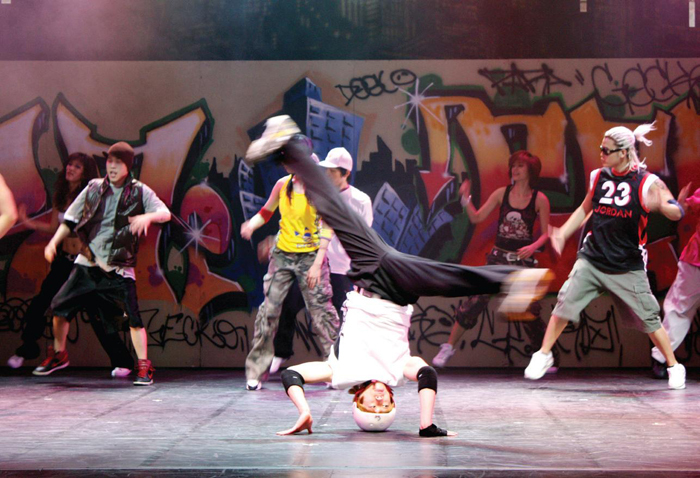 While music and dance play an integral role in all traditional theatrical performances, Korean drama has its origins in prehistoric religious rites. A good example of this classical theatrical form is the masked dance Sandaenori, a combination of dance, song and narrative punctuated with satire and humor. Slightly varying from one region to another in terms of style, dialogue and costume, it enjoyed remarkable popularity among rural people up to the early 20th century. Pansori and the shamanistic ritual known as gut were other forms of sacred theater that appealed to the populace. All of these are still performed in modern Korea, though not very often. There are a few institutions that offer various performing arts in one place, one example being Chongdong Theater in central Seoul. It presents a traditional performing arts series, drama and music. The first performance of singeuk (new drama), a departure from the masked dance and other forms of traditional dramas, was presented in December 1902. However, modern drama began to take firm root in the 1910s after the first Western-style theater was opened in Seoul in 1908. The theater, named Wongaksa, was in operation until November 1909. Theatrical groups Hyeoksindan and Munsuseong were also organized by those who returned from study in Japan and staged sinpa (new wave) dramas. Sinpa was a concept that countered gupa (old wave) drama, meaning kabuki of Japan. Sinpa dramas first dealt with political and military themes and then were diversified into detective stories, soap operas and tragedies. While sinpa dramas proved to be a passing fad, a genuine new wave of dramas was promoted by artists who rallied around Wongaksa and raised the curtain of modern drama. In 1922, Towolhoe, a coterie of theatrical figures, was formed, and led the drama movement across the country, staging as many as 87 performances. Drama remained popular until the 1930s, but then subsided in the socio-political turmoil of the 1940s and 1950s. In the following decade, it was further weakened amidst the boom of motion pictures and the emergence of television. Winter Sonata was the second part of the KBS TV drama series Endless Love. Broadcast on Japan’s NHK, it helped spark the Hallyu (Korean pop culture) wave that has swept Japan and other parts of Asia. Based loosely on a historical figure depicted in the Annals of the Joseon Dynasty, the show focuses on Jang-geum, Korea’s first female royal physician. In the 1970s, a number of young artists began to study and adopt the styles and themes of traditional theatrical works like the masked dance plays, shaman rituals and pansori. The Korean Culture and Arts Foundation (Currently Arts Council Korea) has been sponsoring an annual drama festival to encourage local theatrical performances. At present, a great number of theatrical groups are active around the year, featuring all manner of genres from comedy to historical epics at small theaters along Daehangno Street in downtown Seoul. Some theatrical performances become very successful and are staged for extended runs. The first Korean-made film was shown to the public in 1919. Entitled “Righteous Revenge,” it was a so-called kino-drama designed to be combined with a stage performance. The first feature film, “Oath Under the Moon,” was screened in 1923. In 1926, charismatic actor-director Na Un-gyu drew an enthusiastic response from the public by producing “Arirang,” a cinematic protest against Japanese oppression. After the Korean War in 1953, the local film industry grew gradually and enjoyed booms for about a decade. But the next two decades saw a stagnation of the industry due largely to the rapid growth of television. Since the early 1980s, however, the film industry has regained some vitality thanks mainly to a few talented young directors who boldly discarded old stereotypes in movie making. Their efforts succeeded and their movies have earned recognition at various international festivals including Cannes, Chicago, Berlin, Venice, London, Tokyo, Moscow and other cities. This positive trend has accelerated with more and more directors producing movies based on uniquely Korean stories that have moved hearts worldwide. Korean movie director Kim Ki-duk holds the Golden Lion Award for the movie â€˜Pietaâ€™, during the closing award ceremony of the 69th Venice International Film Festival in Venice, Italy, 08 September 2012. In 2000, ‘Chunhyangjeon’ (The Story of Chunhyang), directed by Im Kwon-taek, became the first Korean film to compete in the Cannes Film Festival. Four other films were screened in non-competitive categories. The film ‘Seom’ (Island), directed by Kim Ki-duk, competed in the Venice International Film Festival. Following these films, in 2001, ‘Joint Security Area’ was selected to compete in the Berlin International Film Festival and another film by Kim Ki-duk, ‘Address Unknown’ entered the competition section of the Venice International Film Festival. Public interest in films has been mounting and several international film festivals have been staged by provincial governments or private organizations in Korea. They include the Busan International Film Festival, the Bucheon International Fantastic Film Festival, the Jeonju International Film Festival and the Women’s Film Festival in Seoul. As in other countries, Korean cinema circles are seeing a noticeable expansion of the animation and cartoon industry. More than 200 companies are producing works in this rising genre. JUMP, the spectacular martial arts performance This dynamic show fuses the ancient Korean fighting arts of taekwondo and taekkyeon with other Asian martial arts. JUMP won the Comedy Award at the Edinburgh Fringe Festival 2006 and the same year excerpts were performed for Prince Charles and the BBC at The Royal Variety Performance. The film, video, animation and online content industries are also undergoing a boom in Korea, fueled by the availability of high-speed Internet services. In 2007, following steep reductions in the screen quota system the previous year, 392 feature films were screened in Korea, a 60 percent increase over 2003. Nearly 30 percent, or 112 of these, were Korean productions. 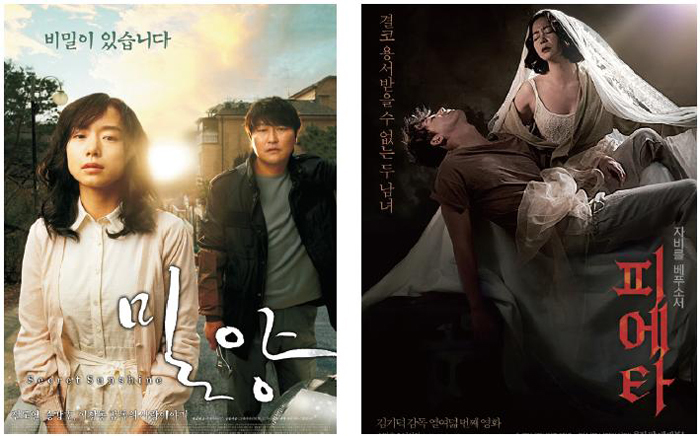 (left) Secret Sunshine (2007, directed by Lee Chang-dong) The story centers around a lady that copes with the death of her husband and child. Jeon Doyeonwon the Best Actress Prize in the 2007 Cannes Film Festival. Pieta (2012, directed by Kim Ki-duk) This film shows that the socially weak, who feel oppressed by the weight of capitalism, includingthe hero Lee Gang-do, who lives like a parasite in a capitalist society due to his limitations, are all people who should be saved by god. 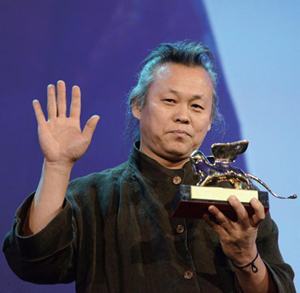 Director Kim Ki-duk won the Golden Lion award at the 69th Venice Film Festival.